Keyboard cases have long been a favorite accessory of mine. 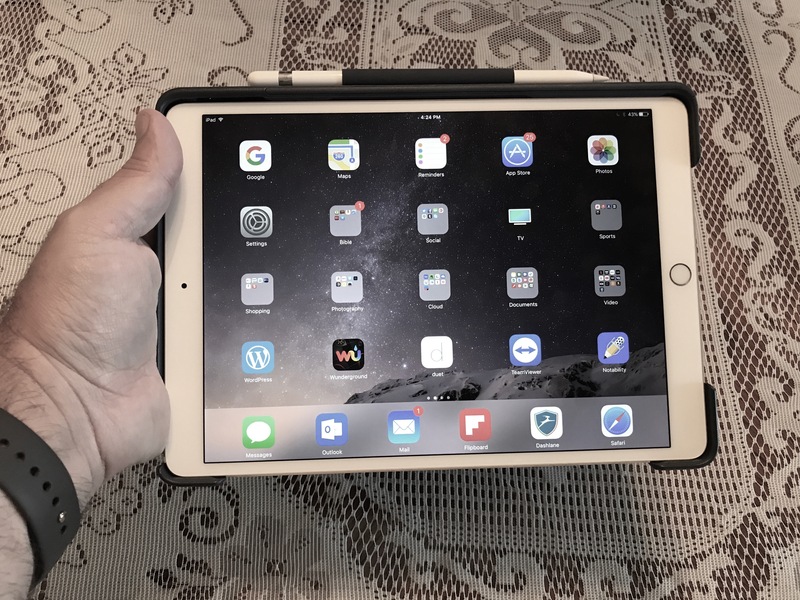 I used to review just about every one that hit the market for the iPad at a couple of my previous writing jobs, and still try most of the good ones out, whether I write about them or not. One thing I have noticed is that all of the keyboard cases for first two iPad Pro models that I have tried have some kind of major trade-off that holds them back. The Logitech Create is, in my opinion, the best of a flawed bunch for the two original iPad Pros. However, it is a bit on the heavy side and it is VERY difficult to get the iPad in and out of it, limiting its versatility. The ZAGG Slimbook was the one I eventually chose to stick with, and still have for my older 12.9″ Pro. 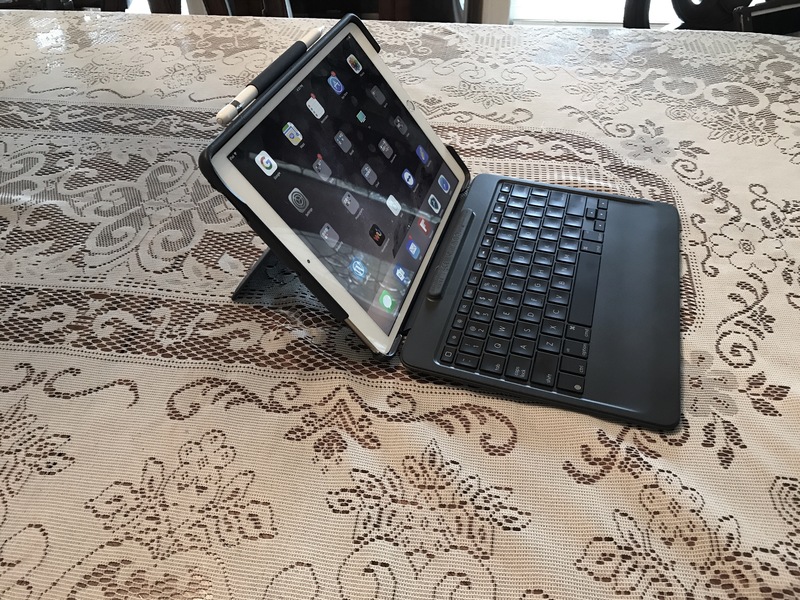 It has a moveable hinge that allows full control over the angle of the iPad, and the case for the iPad undocks from the keyboard, making it the most flexible of the group. However, it is an absolute BRICK. It’s both huge and heavy. It also relies on Bluetooth, rather than the Smart Connector. Then there is Apple’s own Smart Keyboard. Don’t even get me started on that thing. The last time I did, I stepped on a few toes. I’m really not a fan of Apple’s own keyboard solution. When I saw the announcement of Logitech’s Slim Combo right before shipment of the new iPad Pros, I had hope that some of the trade-offs with the original Create had been addressed. The two piece case/keyboard design, the flexible Smart Connector attachment, and hinged kickstand on the back of the case all looked very promising. However, in addressing the trade-offs of the Create, Logitech managed to exchange one set of them for another. How does that come out in the end? Let’s get into the details and find out. The Slim Combo definitely has it over the older Create when it comes to versatility. First of all, the two piece design allows you to remove the keyboard and use the case independly from it. This is a welcomed addition to Logitech’s new keyboard case. However, this does come with some trade-offs of its own. First off, you have to do something with the keyboard when you remove it from the iPad. That’s not such a big deal, though. The bigger issue is that the case portion of the Slim Cover is a bit awkward to hold by itself. The left side of the iPad (the bottom in landscape) is completely exposed to account for the flexible Smart Connector on the keyboard section. This exposed edge with the the plastic of the closed kickstand behind it can feel a little strange in the hand. The other side of the case isn’t much better if you have an Apple Pencil, as that’s where the sleeve to hold it is. If you keep a Pencil in there, it makes it very uncomfortable to hold the iPad from this side. However, at the end of the day, the ability to separate the case from the keyboard is still an improvement for someone like me, even if there are some concessions in the design. 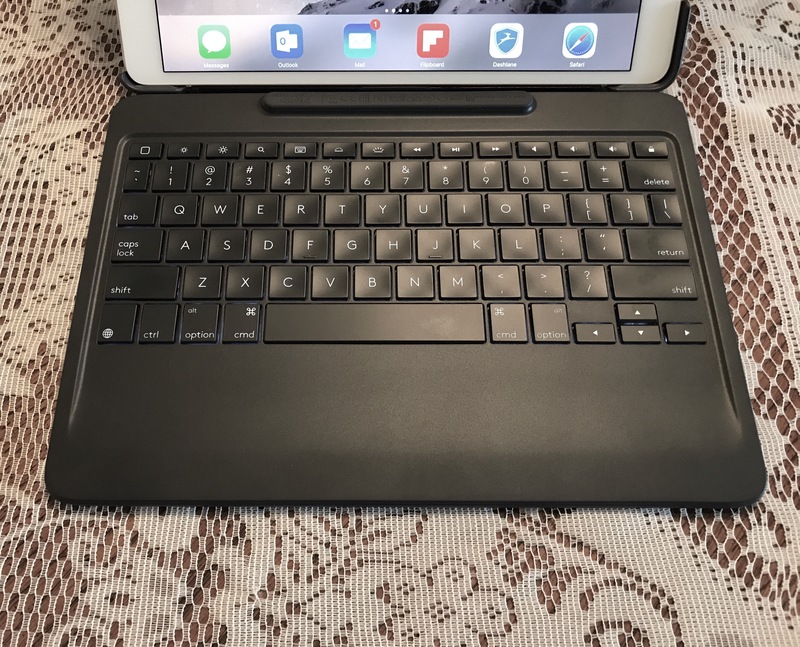 Logitech’s original Create keyboard cases were folio-style with a solid base and a hard dock onto the iPad’s Smart Connector that only allowed for one viewing angle. 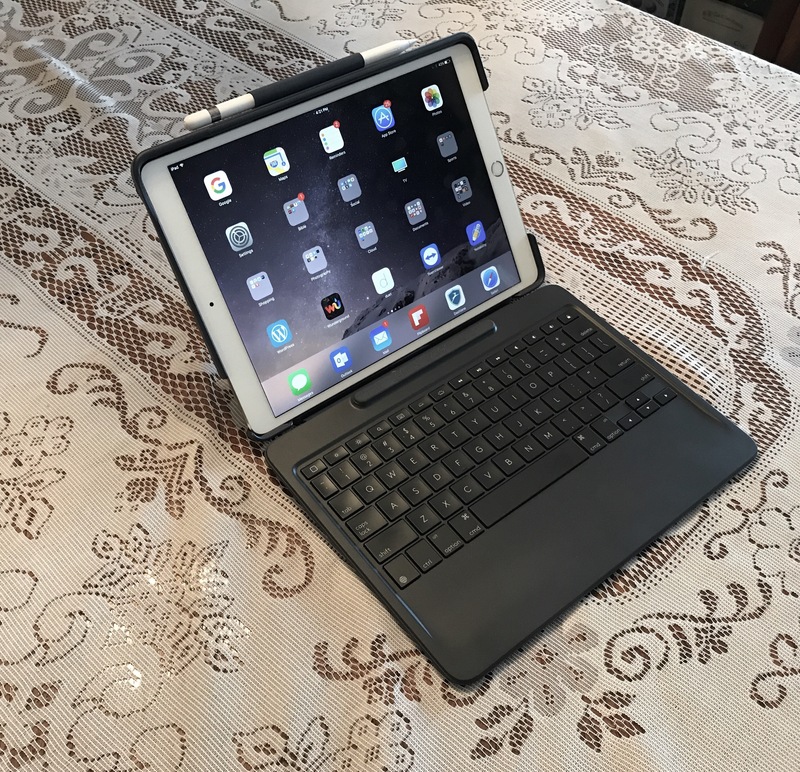 The Slim Combo is a completely different setup, with a hinged kickstand on the back of the case, and a flexible Smart Connector on the keyboard section that allow the user to set the iPad Pro at almost any angle. I tend to use my iPad Pro a lot in my lap with either a keyboard case, or a case and separate Bluetooth keyboard. A hinge on the back of a case usually spells trouble for me doing this, and I normally avoid them because of it. However, I haven’t had any major problems with the Slim Combo. The hinge holds the kickstand completely steady, which is key. It also allows a complete range of motion, so you can set the kickstand up exactly where you need it and know it will stay there. Just take this into account before you buy, and try the Slim Combo out at a local store if you can. However, this concern only applies when using a kickstand case like the Slim Pro on a lap or other uneven surface. If you tend to use your iPad Pro and keyboard case on a table or hard surface, you will never have a moments problem with this case. Another strength of the hinge is its flexibility when using the iPad Pro alone. The full range of motion allows for ideal positioning for watching media, reading, and even using the Pencil to sketch or mark up documents. 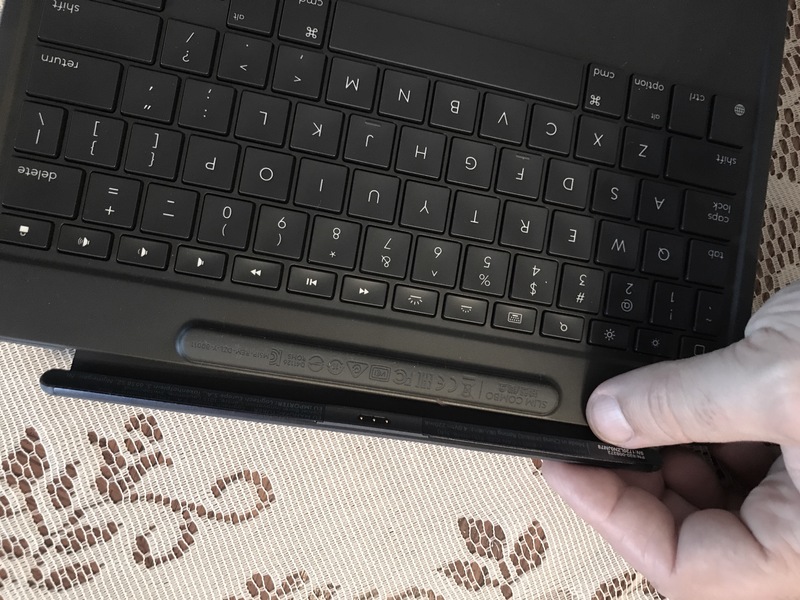 With the ability to remove the keyboard but still use the stand, you can get closer to the screen than if you were using a traditional keyboard case. 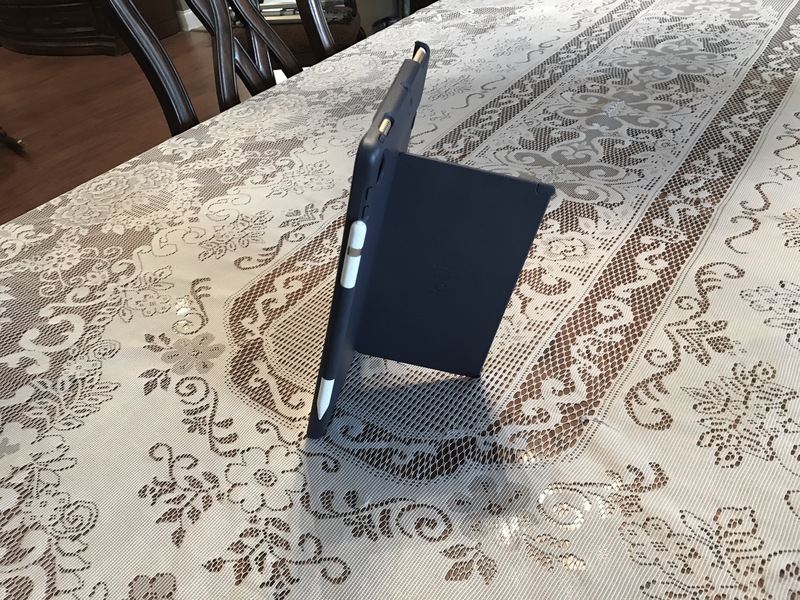 Another “bonus feature” of the Slim Combo’s kickstand is the fact that it will fully support the iPad Pro in portrait orientation. Because the keyboard is dependent on the Smart Connector, you obviously don’t have the option to use it in this situation, but this is still a very useful feature. Portrait is ideal for a lot of reading and document work. This is also a feature that few other keyboard cases can offer, so it’s a solid bonus and worth noting. When you think Logitech, you think about great keyboards. It’s one of the things that they’re best known for, and the Slim Combo is no exception. I typed this entire review with it, and didn’t have any issues at all. The key action is smooth. The response and feedback are just right. The backlight is adjustable and very bright at its third and highest setting. The keys are large enough and spaced enough to be easy to type on. It also has a row of 14 dedicated shortcut keys above the numbers, which I always appreciate. I also appreciate Logitech’s flexible Smart Connector design. This was the only aspect of the Apple Smart Keyboard that I liked, so it’s good to see it used to even better effect elsewhere. About the only very small gripe I have with the design of this keyboard is that Logitech maybe could have made the keys just slightly larger by making the border at the sides a little thinner, and extending down into the wrist rest area behind the keyboard. However, even coming from a 12.9″ Pro keyboard case and a full-size Logitech K811 Bluetooth keyboard, I was completely comfortable typing on this keyboard. I had to adjust slightly at first, but it’s been smooth sailing since then. I’m not going to say that I’m surprised that a Logitech keyboard case has a great keyboard. However, with a product like this that is trying to be and do a lot of things and does have a few trade-offs, the keyboard HAS to be right. In the case of the Slim Combo, it is the ultimate star of the show, and it delivers the goods. We’ve covered the strengths of the Slim Combo. Now we come to some more of the trade-offs that go along with that. I already touched on the awkwardness of holding the case alone. I would be remiss if I didn’t also point out the questionable design issues with the border of this case. I can understand that there is a gap to account for the flexible Smart Connector. However, rather than provide full edge to edge coverage with cutouts where needed around the rest of the edge, Logitech instead chose to just leave gaps around the top left speaker and headphone jack, and the entire center section of the bottom of the case from speaker to Lightning Port to Speaker. These gaps are quite literally gaps in the case’s drop protection, which is perplexing. Another perplexing design decision is how thick the Slim Combo is when the keyboard is closed over the screen. It thick enough that it honestly makes me wonder why they went with this name. You can see here that the keyboard has a large bumper on it for screen protection. The presence of this bumper is fine, as I would rather be sure there is a buffer between the plastic of the keys and the screen if possible. However, it is so big and the edge of the case around the screen so deep that you end up with a Combo that is quite thick at its base. Now, the Slim Combo still fits just fine in my hand and I’m not saying that it is too difficult to hold. I’m just saying that it feels thicker than it has to be. I think the best demonstration of this is the fact that there is a lot of visible “dead space” between the case and keyboard that you can see right through. It just seems like the case could have been slimmed down by just taking a few millimeters off the edges here and there. In my opinion, this isn’t a deal-breaker for me between buying or not buying this case. However, it isn’t a strength of the Slim Combo, either. The other trade-off is a little more balanced, but is still worth pointing out. One of the strengths of this case is that it is much lighter than most other iPad Pro keyboard cases, including Logitech’s own Create. In fact, it is so light that it makes the overall thickness of the Slim Combo seem all the more strange when first holding it. However, one thing that we lose in the exchange for lighter weight is the premium feel. The Create had a solid feeling synthetic material covering it. It felt durable and reassuring in a way. About two-thirds of the back of the Slim Combo’s keyboard is covered with similar material, but the rest of the back on both sides feels very plasticy, for lack of a better word. Now, it doesn’t feel terrible. The case section actually feels solid in the hand and has very little give to it. However, I can’t really understand the decision to cover part of the case with the synthetic fabric covering, but not all of it. Maybe this has to do with keeping the weight down, maybe it doesn’t. However, it is still a little odd. When everything is totaled up, I think the Logitech Slim Combo keyboard case is a solid product. I think it is a little flawed. I think there are trade-offs made that set it back from being great, making it fall somewhere between good and very good. However, I think this case is still very worthy of consideration because it excels in critical areas, where the drawbacks are more superfluous. 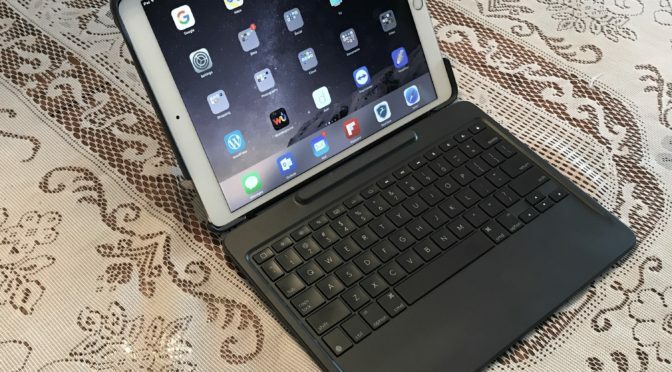 If you are using a 12.9″ iPad Pro, you have a few more options because that hardware design has been available for a while, and there are several keyboard cases on the market for you to choose from. The Slim Cover is still unique among them, but you have choices if it doesn’t meet your needs. However, at this time, the Slim Cover and Apple’s Smart Keyboard are the only keyboard cases available for the new 10.5″ Pro form factor. If you read my earlier article, I Hate Apple Keyboards, which centered mostly on my experience trying the Smart Keyboard, you probably know which I would recommend between the two. Hint- it isn’t Apple’s. 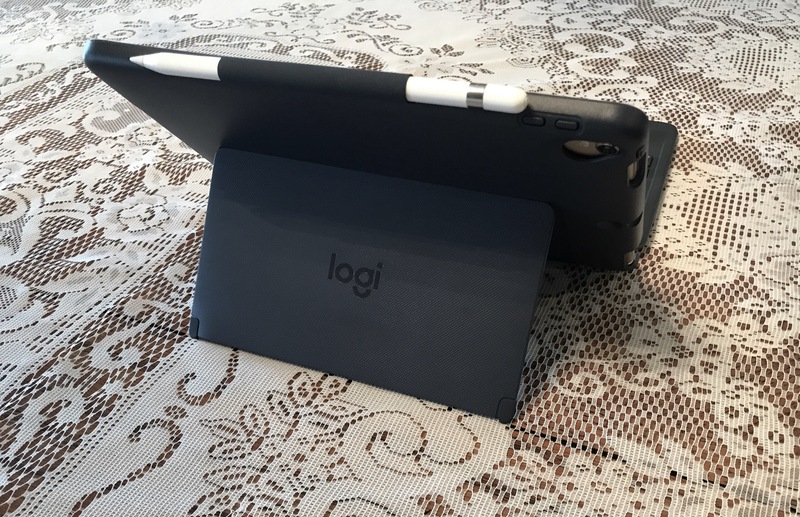 I know that there are several reviews of the Logitech Slim Cover that are more negative than mine, and I understand why. The 10.5″ version that I’m reviewing costs $129.00, so the expectations of the reviewer have to match that. 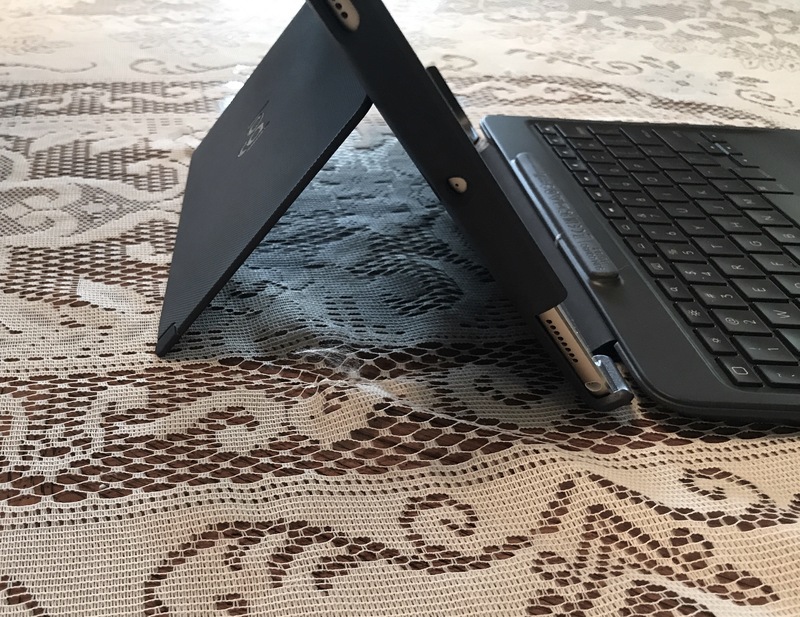 However, I still think the quality of the keyboard, the flexibility that the hinged kickstand provides, and the overall versatility that being able to separate the case and keyboard brings ultimately makes the Slim Cover a worthwhile purchase. I would recommend that potential buyers either try it out before buying, or purchase locally to make a potential return easier if things don’t work out. However, I think most users looking for a keyboard case will be happy with this one. 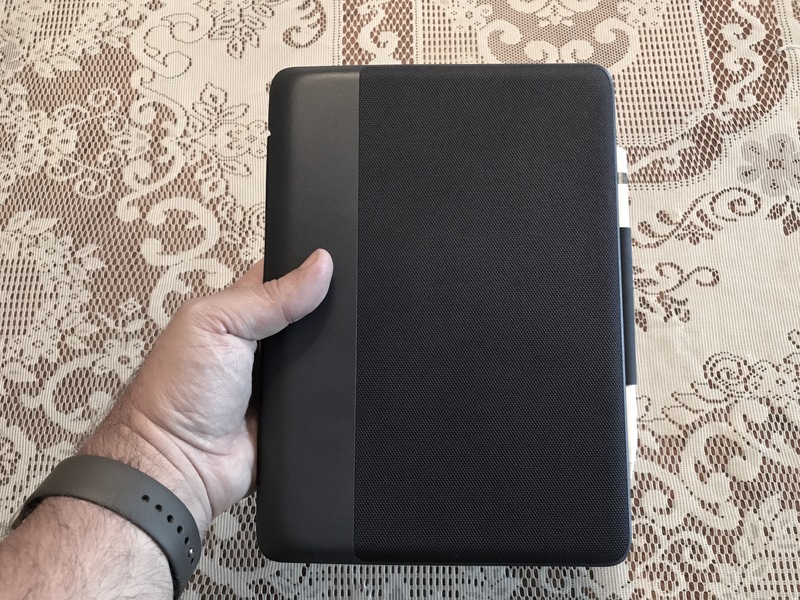 I would love to see an improved version 2.0 of the Slim Cover at some point, but until then, I think it’s a solid product with some noted trade-offs. The Logitech Slim Combo for the 10.5″ iPad Pro is available from Logitech and many retail outlets for $129.99. The 12.9″ version is available for $149.99. 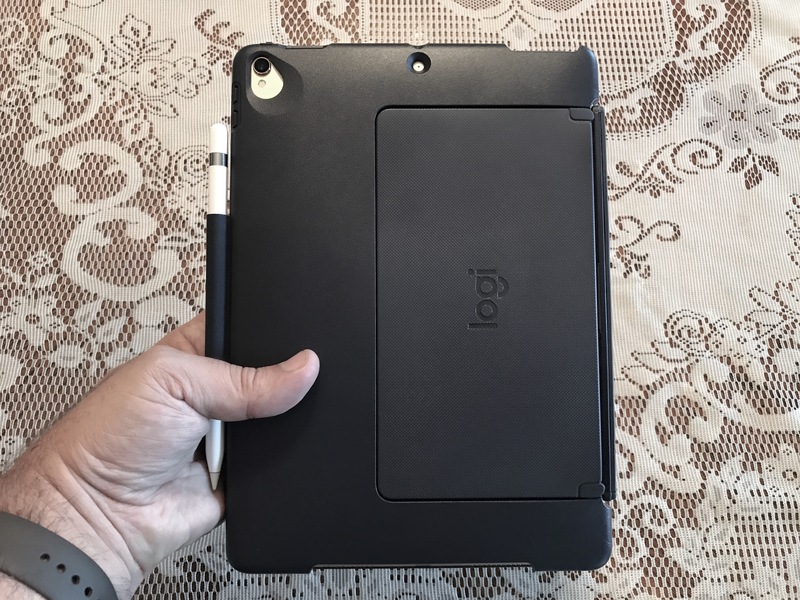 The Slim Combo for the 10.5″ iPad Pro was provided for review on iPad Insight by Logitech. For further information regarding our site’s review policies, please see the “About” page. Nice review and I agree with you. 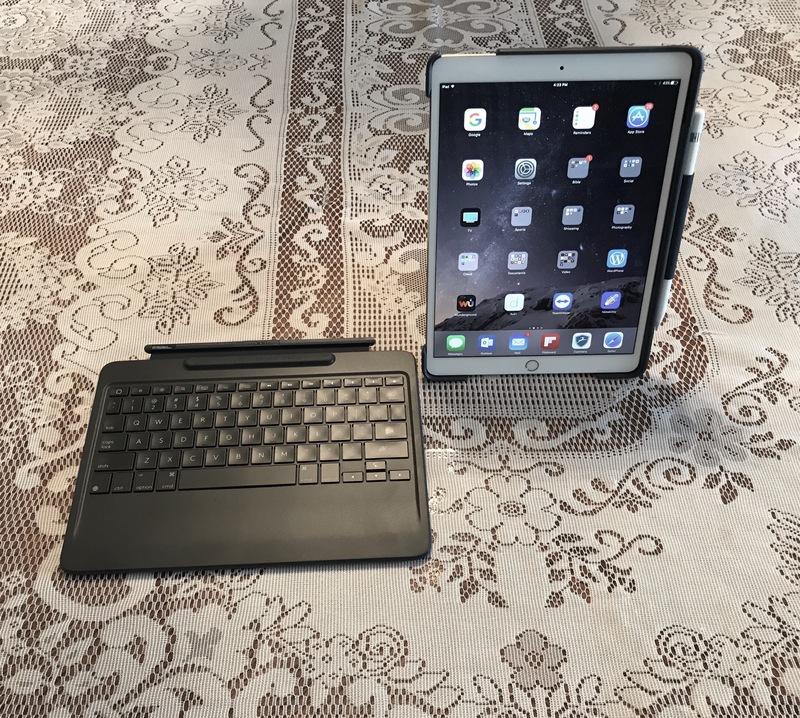 I purchased the SlimCombo over the Apple keyboard/cover as I had used it the Apple keyboard/cover before and felt the lack of wrist rest on the keyboard was too annoying for me and not working too well when using on my lap. My biggest “gripe” with the Slim Combo is what to do with the keyboard when not using it. LIke you said a minor trade-off but something to become comfortable with. Overall, I am liking the Slim-Combo. I am using it now to leve this comment. Thanks for commenting, James. It’s always good to hear from others who have experience with the hardware, as well. Thanks for the nice review. One question: Do you know if the Apple Smart Cover is compatible with the Logitech case if you remove the keyboard? I’m not sure, but probably not. 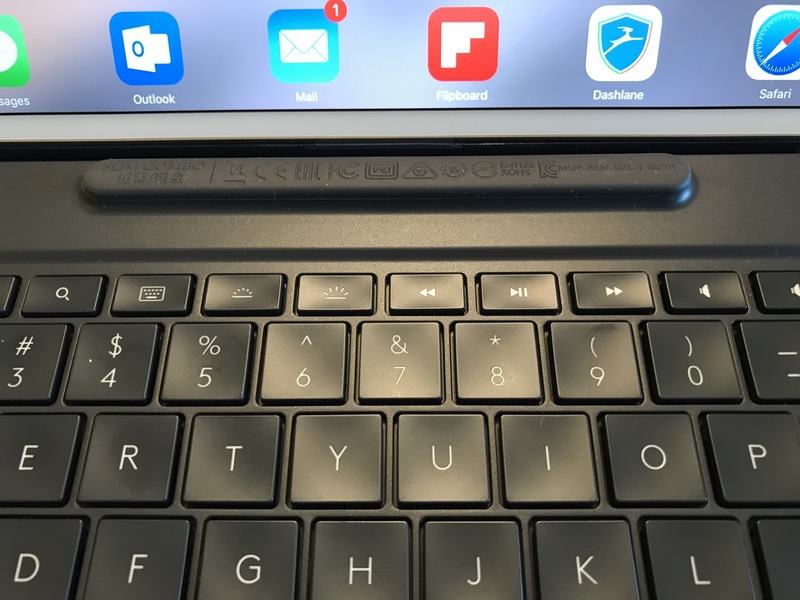 If memory serves, the Smart Keyboard’s Smart Connector goes the length of the iPad’s base. The Slim Combo case covers part of the edges. Thank you very much for this review. But according to me the major issue with the slim combo is that its far more difficult to use on your lap than the previous Create for ipad pro 9.7. Im a bit dissapointed that Logi made this choice. It turns the ipad pro into a Surface like, and the problem is the same when using a kickstand on your lap. On a table of course it’s far more comfortable. You have a good point. I tend to write sitting on my bed, slightly reclined. In this position, the Slim Combo works pretty well. I am actually writing on it right now. However, I can see how this would be a disadvantage for some users who prefer typing in their laps while sitting up. It’s a device of trade-offs. It’s a lot lighter than the Create and more versatile, but it has its own share of flaws. Thanks for reading it! Come back anytime. If you ever have suggestions or requests for tips or items you would like to see reviewed, let me know here, our Facebook page, or on Twitter. Sorry trying another email/name, as the one I tried isn’t being accepted, as my WP account isn’t associated with it! Ugh.